Ahh the familiar tinny sound of Christina Aguilera's 'Dirrty' escapes my co-worker's headphones for the second time today. It got me thinking. Can ambient background noise actually make your office a more productive environment? Not every subheading will be named after a Simon & Garfunkel masterpiece, so enjoy that one. It is a common belief that we need absolute silence to maximise concentration. This is ingrained into us as children - for every test we've ever sat, or every exam we've ever failed, we've been in total silence. Just you, the ticking clock, and the squeaky soles of a hawk-eyed invigilator. Depending on the task, it is true that your brain can function better when surrounding noise is reduced. How many of you turn the music down in your car as you approach a roundabout? You don't do it so that you can see the cars coming, you do it so you can focus on the BMW that isn't indicating. 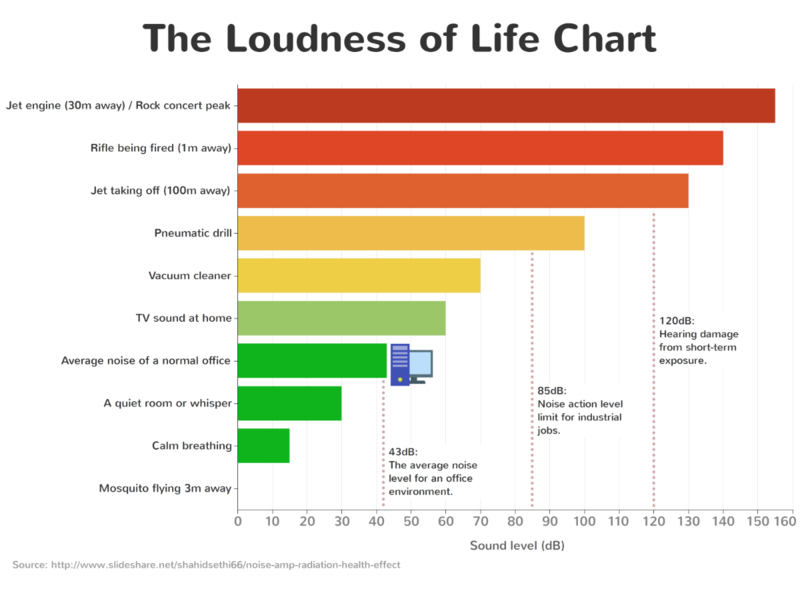 "The Wrong Sound Environment makes you 66% Less Productive" - Noisili. The scientific reason for this is that we require at least two of our senses to deliver an optimum response to any given stimulus. When we eat, we want to see what the food looks like before we taste it. When we go to the cinema, we need to hear as well as see the film. Unless it's a silent film ... Charlie Chaplin aside, you get my point. When it comes to working in an office environment though, sometimes surrounding noise simply cannot be avoided. From outbound calls to the tap, tap, tapping of keyboards, it's pretty much impossible to exist in a totally silent office. As I type this, the paper shredder has become jammed and is now making an unsettling churning sound. What's worse is that there is a car alarm going off outside, and it has been for 20 minutes now. If someone is trying to steal it, why don't they do us all a favour and just hurry up? Admittedly the car alarm isn't technically an office noise or something within our control. This song features a total of 1,560 words in just 6 minutes and 4 seconds. Not ideal for peak concentration in the office. This is where ambient sound comes in. Ambient sound is basically a posh term for 'background' noise - covering anything from water running, birds singing or leaves rustling. Our minds are hardwired to live amongst ambient noise (because ... nature), meaning that a totally silent dwelling seems odd and unpleasant. Even if you crave 'peace and quiet' after putting the kids to bed, you rarely experience actual quiet unless you're going to sleep. The TV may be on, music could be playing, your husband may be snoring - never silent. Even the hum of a refrigerator registers around 39 decibels. So why, when the only silence we get is at bedtime, is it a common belief that a productive office should hear a pin drop? That's how we fall asleep at work folks - just ask this guy. "We found that increasing levels of noise induced distraction, leading to a higher construal level. That is, both moderate and high noise levels lead to more abstract processing as compared to a low noise level. 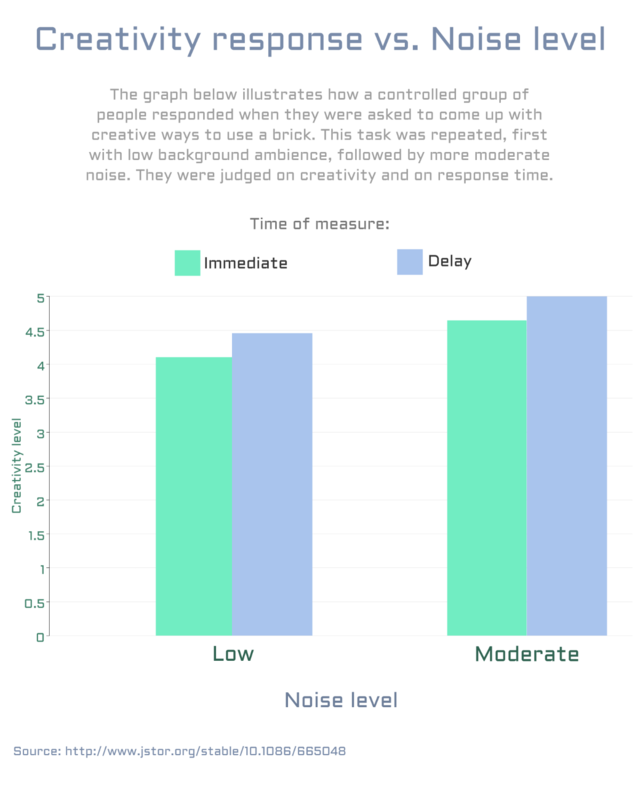 This higher construal level then induces greater creativity in the moderate-noise condition." Let's be honest, the sound of a Transylvanian hurricane is much better than the sound of Deborah's over-zealous typing and Patrick's insufferable tea-slurping. So you've decided that you want a piece of the ambient noise pie, except your boss still isn't buying it, so productivity-boosting chatter is permitted only at lunchtimes or for a timed maximum of 30 seconds every two hours. Well fortunately there is an answer. It involves putting some headphones on and losing yourself in the magical world of sound. I'm not just talking music, but ambient noises recorded from nature. A quick search in the App Store will return tons of ambient noise apps - giving you a wide range of choice when it comes to raindrop noises or leaf crunching. Our personal favourite though is Noisili. It can either be downloaded in the App Store or it can be added to a Google Chromebox in just a couple of clicks. Noisili offers a wide range of pre-recorded scenarios to take your mind on a journey far, far away from the confines of your office - whisking you off to a bustling coffee shop in Soho, a Transylvanian hurricane, or beneath rainfall in a Canadian log cabin. Though you might crave the gravelly tones of Otis Redding or the smooth silk of Sade, it's worth considering what genre of music best suits a thinking brain. Hold on a second though. You're going to need headphones for this. And the last thing you want is loud typing and paper shredders spoiling your ambient whale conversations. There are two types we're interested in here and most people get them confused (for good reason). There are noise cancelling headphones and noise isolating ones. Both ultimately have the end goal of muting any external noises (like Karen's USB desk fan for example), but both achieve the results differently. Noise cancelling - uses inverse wave technology to counteract external sound. Noise isolating - attempt to put a physical barrier between your ear and external sound. For the average office environment, noise isolating will do just fine. While noise cancelling headphones would do just as good a job, they are made more for traveling and dealing with constant droning sounds (which can sometimes occur in the office, can't they Karen?!). This just means you're paying more for the noise cancelling technology when you just don't need it. As a premium pair of headphones for office use, the Bose QuietComfort 20 are an excellent all-round choice. They're discreet, high quality and will bat away any excessive office babble. If you don't fancy taking a mortgage out and selling your first born's soul for some headphones, then there are some cheaper but very competent alternatives on this list. Hats off to you, if you listen to this during working hours without doing the silly dance then you win at this thing called life. Which genres of music feed productivity the most? There's going to be times when you want to listen to more than just rustling leaves on your new office headphones. And though you might crave the gravelly tones of Otis Redding or the smooth silk of Sade, it's worth considering what genre of music best suits a thinking brain. The University of Birmingham investigated the relationship between the playing of background music during the performance of repetitive work and efficiency in performing such a task. "Music is organised sound." - Edgard Varese. The studies revealed that workers experienced an overall rise in efficiency and productivity when they were exposed to music. But what type of music should we listen to? As an extension of the graphic above, here's a list of three of the most inappropriate songs to work to. Supporting the information above, two of the three songs listed below fall into the Metal and Rap genres - considered the least productive of them all. 1. Rap God by Eminem. This song features a total of 1,560 words in just 6 minutes and 4 seconds. Not ideal for peak concentration in the office. 2. Chop Suey! by System of a Down. This is pretty heavy stuff that will not assist spreadsheet making or document filing in anyway. 3. Gangnam Style by Psy. Hats off to you, if you listen to this during working hours without doing the silly dance then you win at this thing called life. At the end of the day, everyone works at various tempos and thrives in different ways. Just because we say rap music is distracting, or that total silence is a bad thing, doesn't mean that it'll suit you. It helps to try out different things when you're working, so you can find your 'happy place'. Try your music at different volumes, try using an ambient noise app, try total silence. Whatever works best for you. Chances are if you deal with numbers or spreadsheets for most of the day, then lyrics will prove interfering; but if you write creatively then the words to a song could just be the spark of inspiration you needed! Ultimately, the industry you work within will decide what noise level will help you thrive.